This entry was posted in adverse effects, Antineoplastons (ANP), bias, biased, Bob Blaskiewicz (Robert J. Blaskiewicz @rjblaskiewicz), critique, critiques, critiqued, critiquing, FDA, United States Food and Drug Administration, Gorski ScienceBlogs.com/Insolence ScienceBasedMedicine, humor, comedy, Nicholas Patronas, M.D., Stanislaw Rajmund Burzynski, The Skeptics and tagged " member in Congress assembled", "adverse event", "adverse events", "antineoplaston treatment", "Area 51", "blogger at skepticalhumanities.com", "Bob Blaskiewicz Faux Skeptic Exposed! 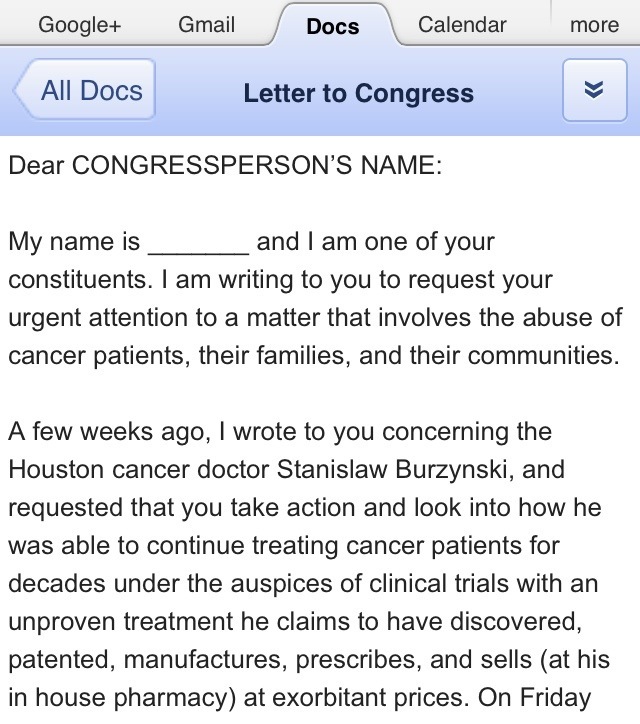 ", "Burzynski: court cases", "Center for Inquiry", "Committee for Skeptical Inquiry", "CONGRESSPERSON’S", "consent form", "conspiracy theories", "day tripper", "Denver International Airport", "Didymus Judas Thomas’ Hipocritical Oath Blog", "doctor Stanislaw Burzynski", "Dr. Burzynski", "Eau Claire", "Forty-eight", "front-page", "Grade 3 events", "Grade 3 or 4", "Grade 4 events", "Hospitalizations/SAE serious adverse events", "How to Crank your Congressperson (according to The Skeptics: USA TODAY vs. Dr. Stanislaw Burzynski)", "http://stanislawrajmundburzynski.wiki-site.com/", "http://stanislawrajmundburzynski.wiki-site.com/index.php/", "http://stanislawrajmundburzynski.wiki-site.com/index.php/Main_Page", "https://stanislawrajmundburzynski.wordpress.com/2013/04/26/burzynski-court-cases/", "https://stanislawrajmundburzynski.wordpress.com/2013/12/07/how-to-crank-your-congressperson-according-to-the-skeptics-usa-today-vs-dr-stanislaw-burzynski/", "https://docs.google.com/document/d/1Hx3KJ6mmCd8MTdlbdXb2r2qrN9l3JjrzdJrHh0VIJXo/mobilebasic?pli=1", "in house", "informed consent", "investigational plan", "Jesse Ventura", "Josia Cotto", "JREF Swift Blog contributor", "Letter to Congress", "Main Page – Stanislawrajmundburzynski", "Northeast Conference on Science and Skepticism", "on-study treatment", "Over dose", "patient records", "principal investigator", "Secret Service", "Skeptical Inquirer", "Skeptical Inquiry", "Skepticality podcast", "Smoke ‘em if ya got ‘em", "St. Louis, "staff’s", "stanislawrajmundburzynski.wiki-site.com/", "The Burzynski Skeptics", "The Virtual Skeptics", "toxic effects", "toxic events", "trial number", "U.S. Food and Drug Administration", "University of Wisconsin", "USA TODAY vs. Dr. Stanislaw Burzynski", "USA TODAY", "Visiting Assistant Professor of Writing at the University of Wisconsin-Eau Claire", "web columnist", "whacky weed tobacco", #FAILED, able, about, abuse, According, accordingly, account, Act, action, actions, actual, actually, add, added, Additionally, administer, admitted, Adverse, agents, ago, agreements, alarming, Aliens, allegations, allow, alone, also, another, any, apparent, are, article, ask, asking, associating, attention, auspices, authorities, available, “cancer patients", “complete responses”, “Conspiracy Guy”, “Dear Congressperson Y", “Down, “high sodium", “Look, “one”, “Rocky Mountain High”, bankrupt, base, baseline, bathroom, before, began, begin, betrayal, billing, Blatherskitewicz, Board, book, bosses, Burzynski Clinic, CALLING, Cancer, cancerous, care, carried, cases, catheter, challenged, child, claims, clinic, Clinical, Clinical Trials, Colorado, coming, communities, comply, compose, concerning, conduct, Congratulations, Congress, Congressperson, consent, constituents, contacted, contacting, continue, corrective, cost, costs, could, couple, cowards, CRANK, criteria, criteria defined, criticism, crooks, damning, days, dear, decades, desperate, Despite, destroyed, determine, die, discovered, disqualifying, Doctor, document, documentation, documents, Doubtful, drug, drugs, during, effect, electronic, emphasis, enjoy, enrolling, ensure, ethically, event, example, exhibiting, exorbitant, experienced, exploitation, Expose, extort, extra, F.D.A., families, family, FDA, few, figures, finding, findings, fodder, FOIA, followed, Food and Drug Administration, For, former, forward, found, from, further, get, got, grab, great, greatest, hang, happened, have, having, hear, help, his, horrifying, hospitalization, Houston, how, http://anp4all.com, http://blog.rbutr.com/, http://centerforinquiry.net/speakers/blaskiewicz_bob, http://lanyrd.com/2013/tam/sckkdy/, http://necss.org/speakers/bob-blaskiewicz/, http://rbutr.com/, http://skepticalhumanities.com/, http://thehoustoncancerquack.com/, http://uwec.edu/Staff/blaskir/, http://virtualskeptics.com/, http://www.centerforinquiry.net/speakers/blaskiewicz_bob, http://www.csicop.org/author/rblaskiewicz, http://www.skepticalhumanities.com, http://www.uwec.edu/Staff/blaskir/, https://mobile.twitter.com/rjblaskiewicz, Hypernatremia, implemented, inaccurate, incidents, include, included, including, inclusion, incurred, individuals, infection, informed, initially, innuendo, inspection, inspectional, instance, intellectually, interviewed, into, investigated, investigation, investigational, investigator, involves, IRB, just, known, lab, last, laugh, legal, legislation, letter, liars, life, like, limited, list, mafia, maintain, man", manufactures, Many, matter, mean, means, measurement, measurements, meet, members, might, missive, Missouri", money, monitor, month, more, most, my, name, Newsie, newspaper, Next, none, notes, nothingness, observed, office, online, only, other, out, outcome, outcomes, over, Overdose, overdosed, overdoses, overload, oversight, own, Partial Response, patented, patient, patients, people, period, pharmacy, physician, piss, please, plethora, prescribes, pretend, prevent, prices, primary, prime, prior, process, programmable, progress, prostitutes, protect, protocol, protocols, provide, pump, push, qualify, r-but-r, rbutr, reading, receiving, recorded, redact, redacted, related, released, removed, report, reported, request, requested, required, requirements, requires, research, Response, review, reviewed, reviews, rights, rjblatherskiewicz, role, Room, Sadly, SAE, safety, said, saying, says, seems, select, sells, sent, several, shoot, show, shut, sick, signed, silly, similar, since, sincerely, single, site, Skeptical Humanities, skepticalhumanities, Sodium, some, something, specifically, stable Disease, Stanislaw Burzynski, starting, statement, statements, stock, studies, Study, stunning, subject, subjects, such, suggestion, support, supposed, take, The Skeptics, their, them, therapeutic, there, these, they, thieves, this, time, told, touch, Treating, treatment, trials, tumor, unable, Under”, understand, unproven, unpublishable, unthinkable, until, urgent, USATODAY, valuable, various, via, virtualskeptics, walks, wall, waste, way, week, weeks, welfare, were, WHAT, when, which, Wisconsin" http://uwec.edu/Staff/blaskir/, with, without, worksheets, world, would, writing, wrote, Years, you, your, yourself, zinger by didymusjudasthomas. Bookmark the permalink.